Hello Kitty is surely an icon for young girls. I remember Hello Kitty just filtering in when I was a young girl. Now we have just about anything you want Hello Kitty and it is so fun!! Blip Toys has a new line of Hello Kitty which includes the first ever poseable Hello Kitty Doll. These large 13.5" dolls can sit, stand and move about like a real doll. Girls 4-6 will love changing Hello Kitty's clothes, snuggling her at night, and interacting with her for the day. The large poseable doll comes in 4 Hello Kitty varieties; Princess, Dancer, Best Friend and Pop Star. These dolls are completely plastic making them easier to stay in the position you place them. For girls who love Hello Kitty, this is the perfect addition to their collection. Blip Toys even has a bed and scooter as additional accessories to buy. Dolls SRP $24.99 these dolls and other Hello Kitty toys are available at Target this Holiday season! This is such a cute doll! 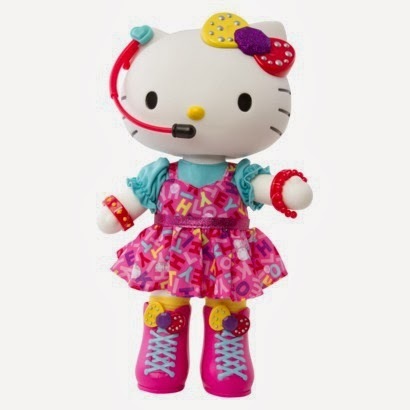 I like the Hello Kitty line of products, and this would be a great doll to give to my niece. The colors of this doll are so pretty. My girls would enjoy this Hello Kitty Doll thanks for sharing!